In Major League Baseball, spring training is a series of practices and exhibition games preceding the start of the regular season. Spring training allows new players to try out for roster and position spots, and gives existing players practice time prior to competitive play. Spring training has always attracted fan attention, drawing crowds who travel to the warmer climates to enjoy the weather and watch their favorite teams play, and spring training usually coincides with spring break for many US college students. 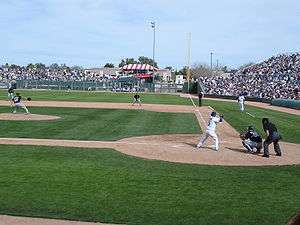 Spring training typically starts in mid-February and continues until just before Opening Day of the regular season, traditionally the first week of April. In some years, teams not scheduled to play on Opening Day will play spring training games that day. Pitchers and catchers report to spring training first because pitchers benefit from a longer training period. A few days later, position players arrive and team practice begins. Team members normally wear their batting practice uniforms for the duration of spring training and only wear their normal jerseys beginning on Opening Day. 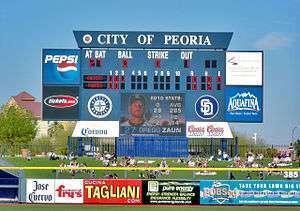 A 2007 Cactus League game between the Cubs and the White Sox at HoHoKam Park. Spring training by major league teams in sites other than their regular season game sites first became popular in the 1890s and by 1910 was in wide use. Hot Springs, Arkansas has been called the original "birthplace" of Spring Training baseball. The location of Hot Springs and the concept of getting the players ready for the upcoming season was the brainchild of Chicago White Stockings (today's Chicago Cubs) team President Albert Spalding and Cap Anson. In 1886, the White Stockings traveled to Hot Springs to prepare for the upcoming season. Practicing at the Hot Springs Baseball Grounds, the White Stockings had a successful season and other teams took notice and began holding spring training in Hot Springs. The Cleveland Spiders, Detroit Tigers, Pittsburgh Pirates, Cincinnati Reds, Brooklyn Dodgers and Boston Red Sox followed the White Stockings to Hot Springs. Whittington Park/Ban Johnson Park (1894), Majestic Park (1909) and Fogel Field (1912) were all built in Hot Springs to host Major League teams. 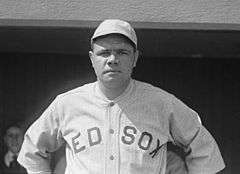 Famously, a young pitcher named Babe Ruth of the Boston Red Sox was playing an emergency game at first base on St. Patrick's Day, 1918, his first time playing the field. Ruth would hit two home runs that day in Hot Springs, and the second was a 573-foot shot that landed across the street from Whittington Park in a pond of the Arkansas Alligator Farm and Petting Zoo. Soon he was playing the field more often. Over 130 Major League Baseball Hall of Famers, including such names as Ruth, Cy Young, Cap Anson, Honus Wagner, Ty Cobb, Tris Speaker, Walter Johnson, Rogers Hornsby, Mel Ott and Jimmie Foxx were involved in Hot Springs Spring Training games. The First Boys of Spring is a 2015 documentary about Hot Springs Spring Training. The film was narrated by area native, actor Billy Bob Thornton, and produced by filmmaker Larry Foley.The documentary began airing nationally on the MLB Network in February, 2016. 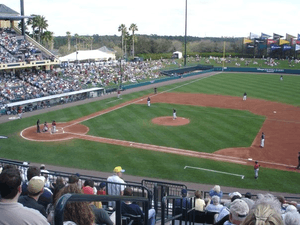 The Braves Spring Training game against the Mets in 2008. Generally, teams train in either Florida or Arizona based on their geographic location in the U.S., with eastern teams playing in Florida and western teams training in Arizona; the exceptions being the Cleveland Indians, Cincinnati Reds, Milwaukee Brewers, and the two Chicago-based teams all training in Arizona. The last west-coast team to train in Florida was the Los Angeles Dodgers, who moved to Arizona in 2009. 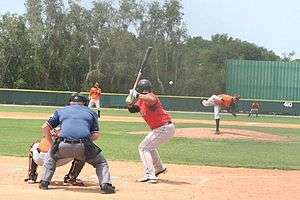 In modern training, teams that train in Florida will play other Florida-training teams in their exhibition games, regardless of regular-season league affiliations. Likewise, Arizona-training teams will play other Arizona teams. These have been nicknamed the Grapefruit League and Cactus League, respectively, after plants typical of the respective states. The teams can play colleges, minor league baseball clubs, intra-squad games (members of the same team play against each other), split-squad games (games when one team is scheduled for two games in one day, so the team splits into two squads and each squad plays in one of the games), and B Games (unofficial Spring Training games where statistics and standings are not counted). In years when the World Baseball Classic occurs, the national teams in the tournament prepare by playing major league teams. The Peoria Sports Complex hosts the Padres and Mariners. An extended spring training game between the Red Sox and Orioles in Sarasota, Florida during the 2008 season. ↑ Johnson, Rodney (2012). "From Dust to Diamonds: The Evolution of the Cactus League". CactusLeague.com. Retrieved 21 September 2012. ↑ Arsenault, Raymond. 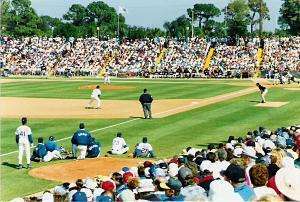 "Spring Training Baseball in Florida – Our Roots Run Deep". Retrieved May 16, 2011. ↑ "Atlanta Braves Official Website". MLB. Retrieved March 5, 2011. ↑ "Baltimore Orioles Official Website". MLB. Retrieved March 5, 2011. ↑ "Boston Red Sox Official Website". MLB. Retrieved March 5, 2011. ↑ "Detroit Tigers Official Website". MLB. Retrieved March 5, 2011. ↑ "Houston Astros Official Website". MLB. Retrieved March 5, 2011. ↑ "Florida Marlins Official Website". MLB. Retrieved March 5, 2011. ↑ "Minnesota Twins Official Website". MLB. Retrieved March 5, 2011. ↑ "New York Mets Official Website". MLB. Retrieved March 5, 2011. ↑ "New York Yankees Official Website". MLB. Retrieved March 5, 2011. ↑ "Philadelphia Phillies Official Website". MLB. Retrieved March 5, 2011. ↑ "Pittsburgh Pirates Official Website". MLB. Retrieved March 5, 2011. ↑ "St Louis Cardinals Official Website". MLB. Retrieved March 5, 2011. ↑ "Tampa Bay Rays Official Website". MLB. Retrieved March 5, 2011. ↑ "Toronto Blue Jays Official Website". MLB. Retrieved March 5, 2011. ↑ "Washington Nationals Official Website". MLB. Retrieved March 5, 2011.